The image of bilingualism has not always been this rosy. For many parents, the decision to raise children speaking two languages was controversial. Since at least the 19th century, educators warned that it would confuse the child, making him unable to learn either language properly. At best, they thought, the child would become a jack-of-all-trades and master of none. At worst, they suspected it might hinder other aspects of development, resulting in a lower IQ. On december 4th, 2011, I posted article in portuguese about benefits of bilingualism. Click here to see it. These days, such fears seem unjustified. True, bilingual people tend to have slightly smaller vocabularies in each language than their monolingual peers, and they are sometimes slower to reach for the right word when naming objects. But a key study in the 1962 by Elizabeth Peal and Wallace Lambert at McGill University in Montreal found that the ability to speak two languages does not stunt overall development. On the contrary, when controlling for other factors that might also affect performance, such as socioeconomic status and education, they found that bilinguals outperformed monolinguals in 15 verbal and nonverbal tests. Although a trickle of research into the benefits of bilingualism followed that study, it is only within the past few years that bilingualism has received a lot of attention. Indeed, the closer the researchers looked, the more benefits they discovered, some of which span a broad range of skills. Ellen Bialystok, a psychologist at York University in Toronto, first stumbled upon one of these advantages while asking children to spot whether various sentences were grammatically correct. 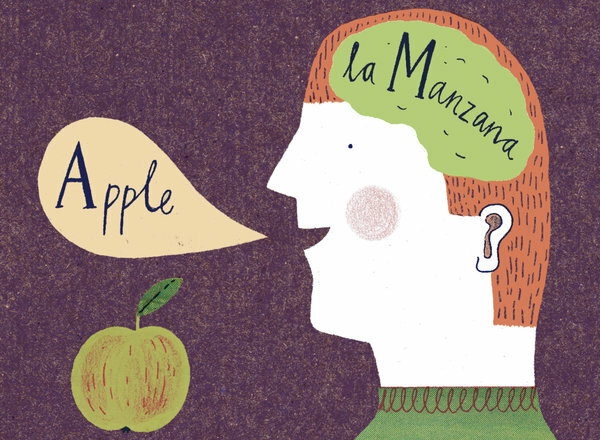 Both monolinguals and bilinguals could see the mistake in phrases such as “apples growed on trees,” but differences arose when they considered nonsensical sentences such as “apples grow on noses.” The monolinguals, flummoxed by the silliness of the phrase, incorrectly reported a grammar error, whereas the bilinguals did not. Bialystok suspected that rather than reflecting expertise in grammar, the bilinguals’ performance demonstrated improvement in the brain’s executive system, a broad suite of mental skills that center on the ability to block out irrelevant information and concentrate on a task at hand. In this case, the bilinguals were better able to focus on the grammar while ignoring the meaning of the words. In subsequent studies, bilingual kids aced a range of problems that directly tested their grammatical strength. Paula Rubio-Fernandez and Sam Glucksberg, psychologists at Princeton University, have found that bilinguals are better at putting themselves in other people’s shoes to understand their side of a situation. This is because they can more easily block out what they already know and focus on the other viewpoint. Avançar Próximo post: Seleção pública do Programa Petrobras Cultural 2012. O Programa vai destinar R$ 67 milhões. Os especialistas dizem que é muito difícil ser fluente em outra língua após a puberdade. Por isso, invista nos seus filhos falar em outras línguas. O conhecimento de outras línguas torna seu vocabulário mais complexo e completo. On december 4th, 2011, I posted article in portuguese about benefits of bilingualism. Can you search here to see it.